Recently I acquired perforated and imperforate sets of forgeries of this issue. I have placed new images of them above. The sale of these forgeries continues with no end in sight. 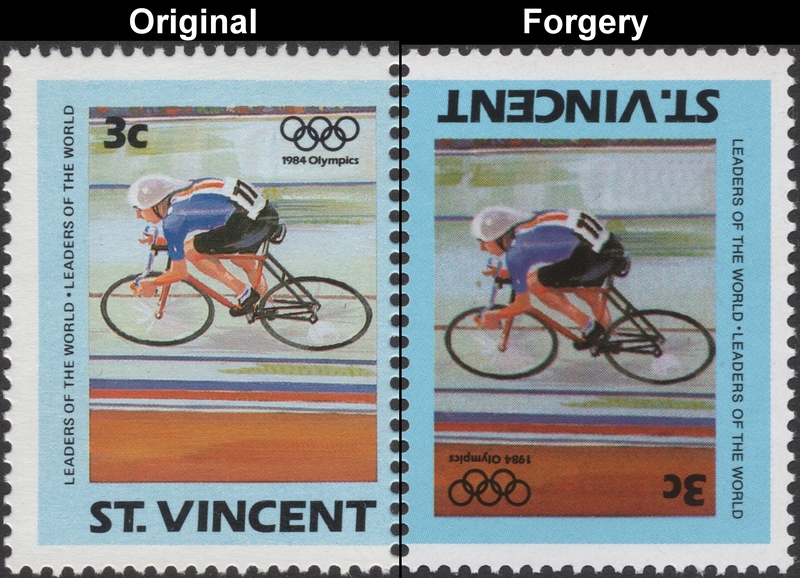 Every variety of this issue is now suspect of being forgeries. 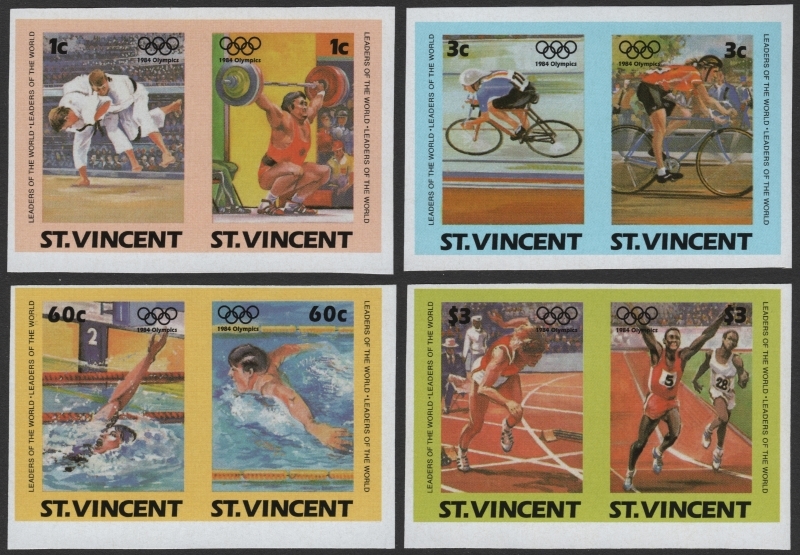 I noticed sales of the Saint Vincent Leaders of the World Summer Olympic Games issues as inverts being sold on ebay and other places months ago. Dealers from the UK to Israel were and are selling them as I write this. The asking prices range from $20-40.00 a set! They have been sold to numerous buyers. 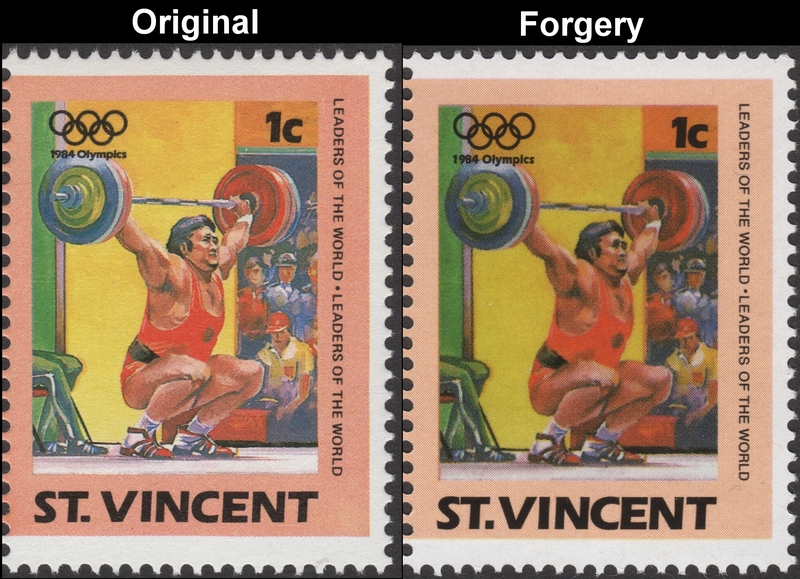 I knew that they are forgeries because other forgeries I have purchased from these dealers already. 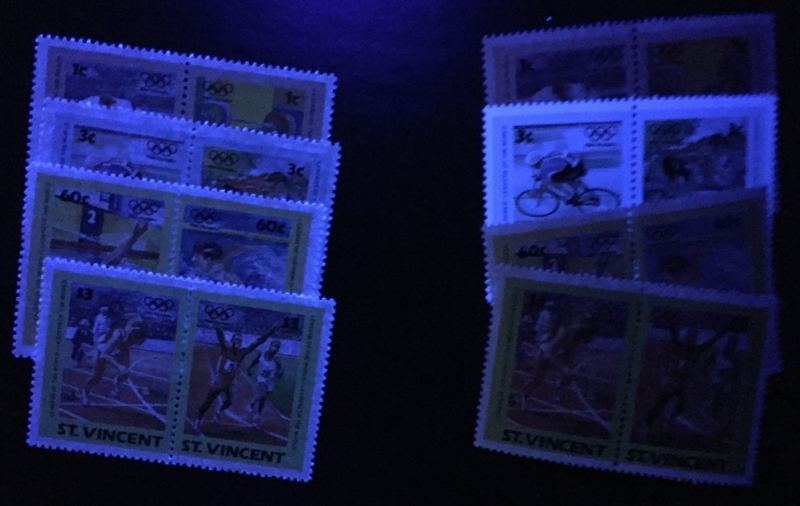 So I recently purchased a perforated set from a dealer in Israel with user name thematicstamps2014 selling them on Delcampe and sure enough they are exactly the same as all the other forgeries I have written about. I got them for $24.99 fixed price. The imaged set at the top of the page is what I got. 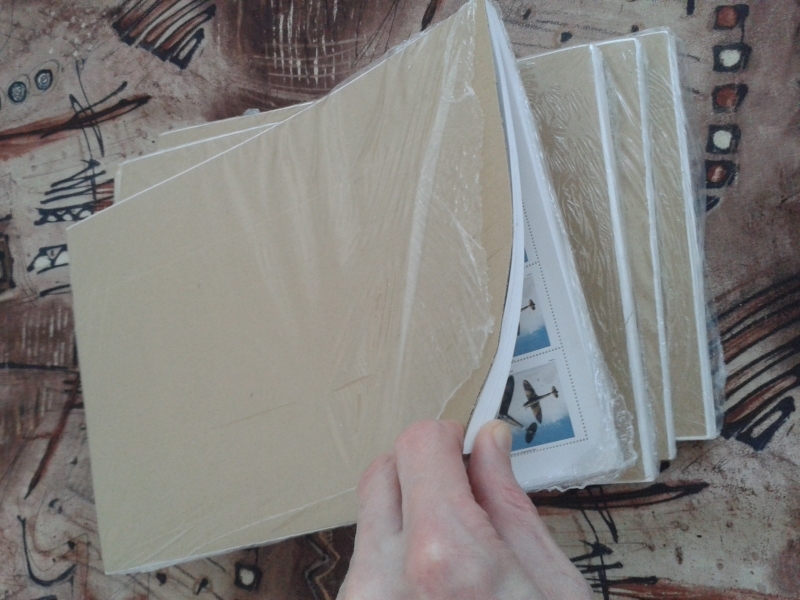 I purchased the imperforates from armi777 who is based in Latvia and is connected with asrm10 and balticamber2011 and raimissss. 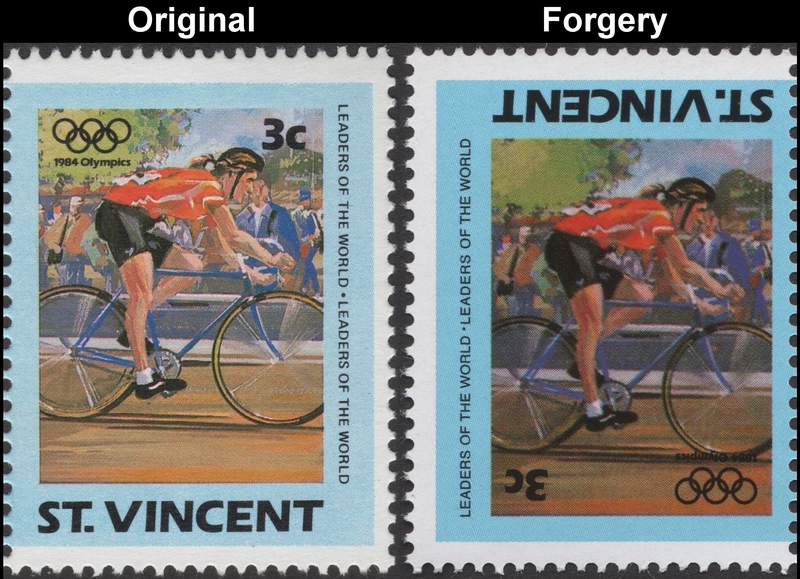 I purchased the perforated set recently from a Canadian dealer who did not even know they were forgeries. Aside from the Canadian dealer these other dealers persist in selling these and many other forgeries to this day! I have found that the inverts which have the white gum all glow brightly. Here is the comparison. Now here is where it starts getting very confusing. 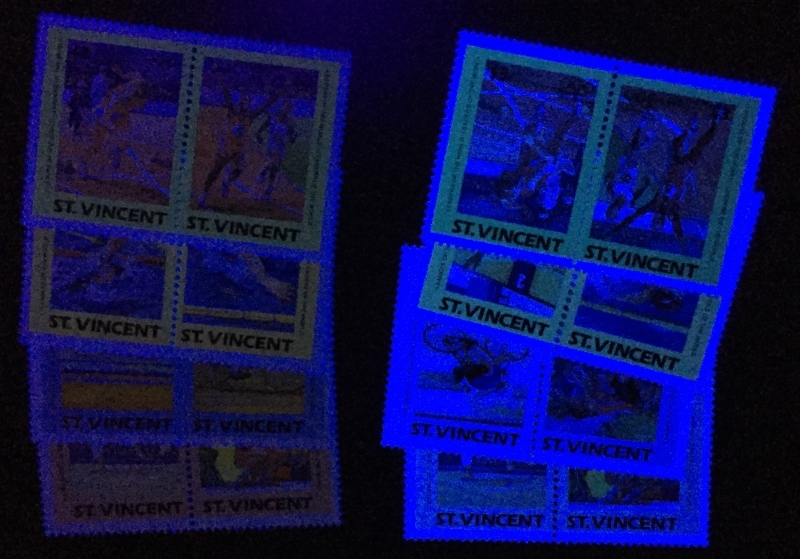 For the normal perforated version of this issue that I have purchased only one (the 3c value) of the forgeries glow brightly as this image shows. 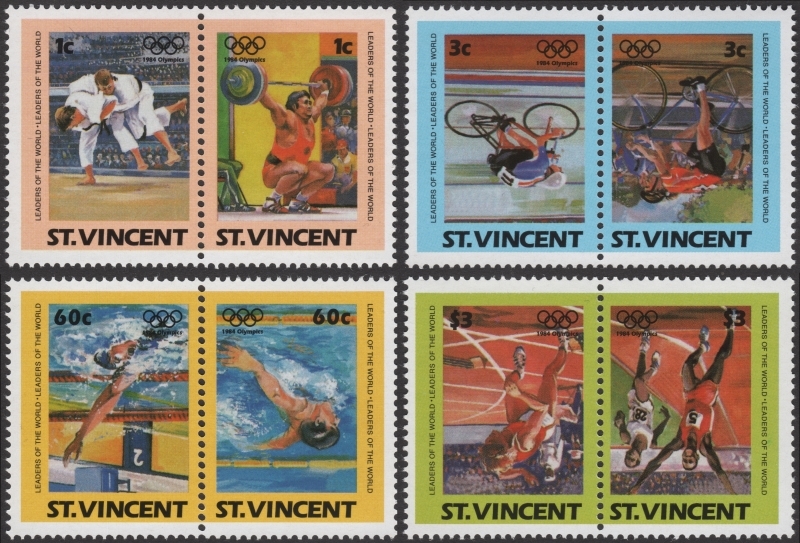 The rest are even darker (no glow) than the genuine stamps! All have the yellowish gum. Even though these are two different printings the colors, fonts and everything in normal lighting is the same. For this issue I have found both gum types. The fake inverts (lower right) have the white gum. 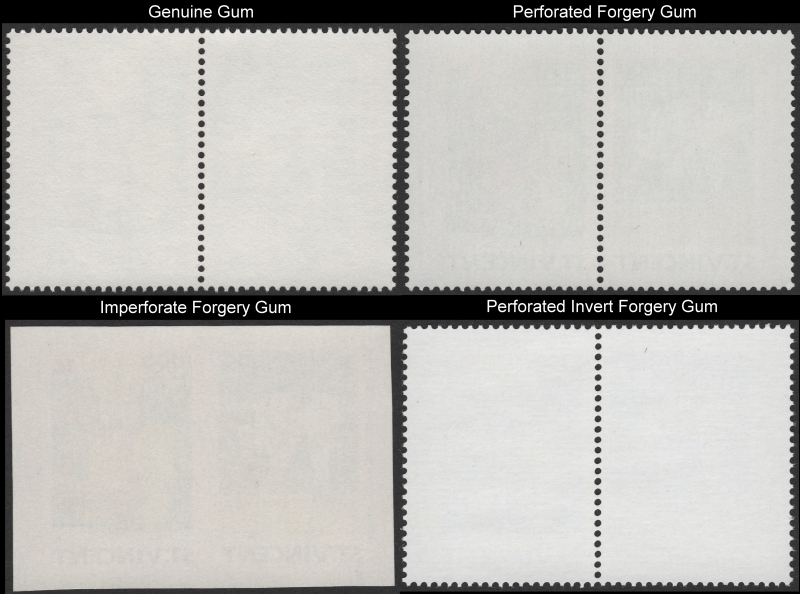 The normal perforated stamp forgeries and the imperforate stamp forgeries have the yellowish gum. I imaged the imperfs before I lost them somewhere. Because we have both types of gum I am putting in both descriptions. Unlike the gum on many of the forgeries that are flooding the market right now the gum is more yellowish in color on these. It is opague though in comparison with the original gum. This type of gum has appeared on several other issues I have detected as forgeries like the St. Vincent Century of Motoring issue and several Locomotives sets. It is having a tendancy to curl worse than original gum. I do not know if these were produced earlier by the forger and	held until now, but they did not appear here on the market until recently. 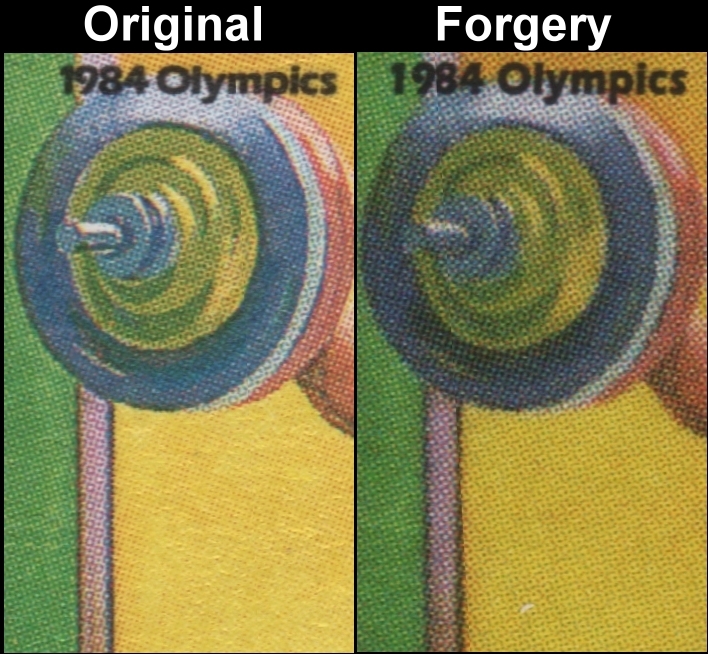 Everything else about the forgeries is the same as all the other forgeries I have described as you will see. This yellowish gum does make them harder to detect though at first glance without originals to compare with. For the imperforate inverts...well I cannot afford to buy everything. It stands to reason though because the inverted frame set I did purchase has the white gum that the imperforate inverts probably have the white gum as well. 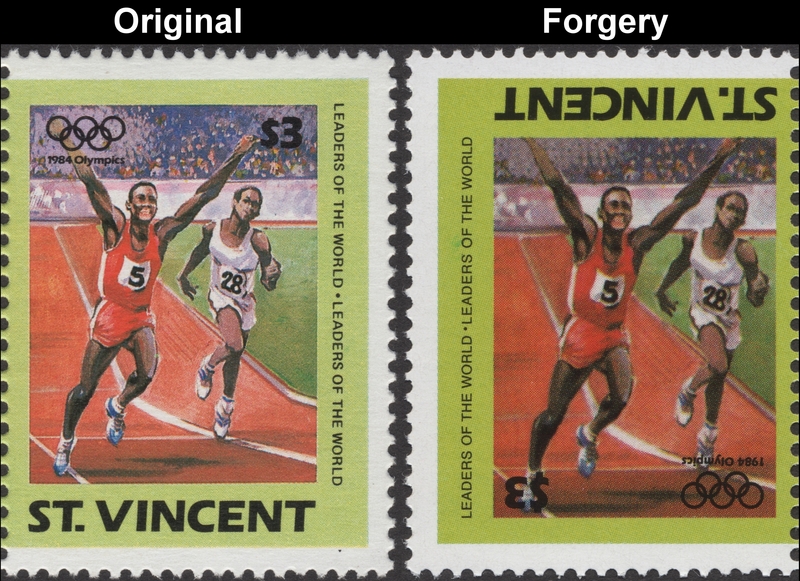 Let us use the 1c stamps for high resolution comparisons. I use 1200dpi scans for viewing. You may have noticed that the 1c fake value is not inverted! Don't ask me why...I guess the forger forgot to "invert" it. This first comparison shows you how inferior the screens are. I first compare the Judo Athelete. 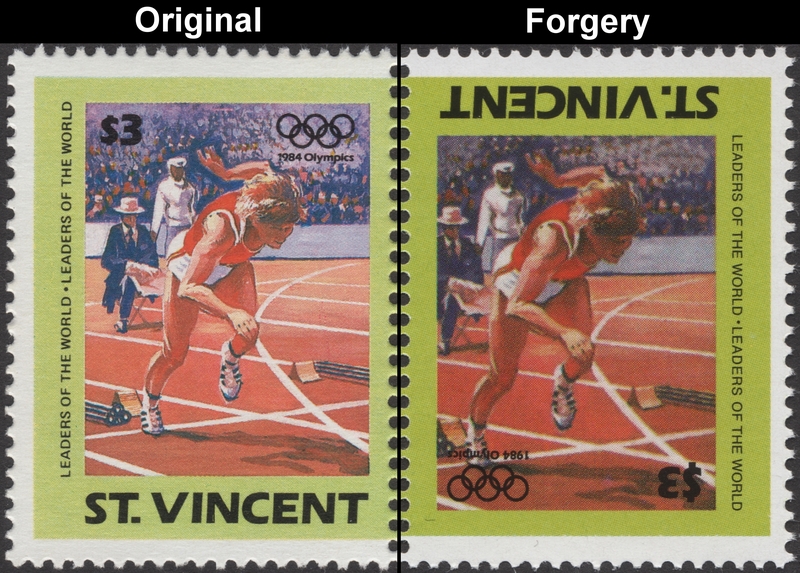 You can see that the screens used on the forgery are coarser. 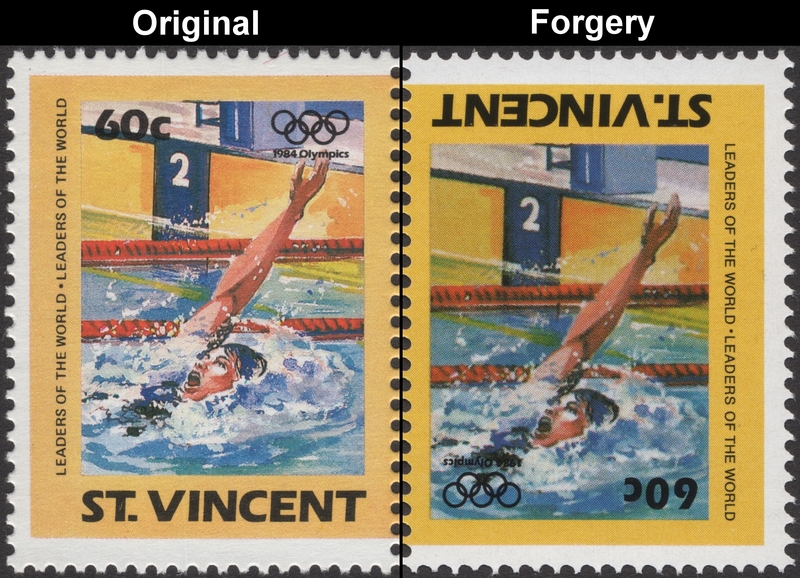 Much of the details are lost on the forgery. 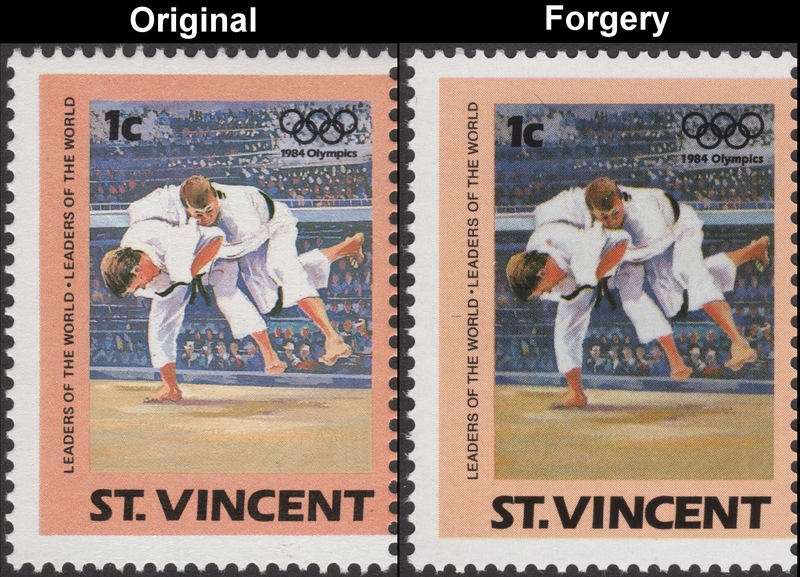 You may not notice that the forgery has screening all over the judo athlete whereas on the original there is no screening on the whitest areas of his uniform. 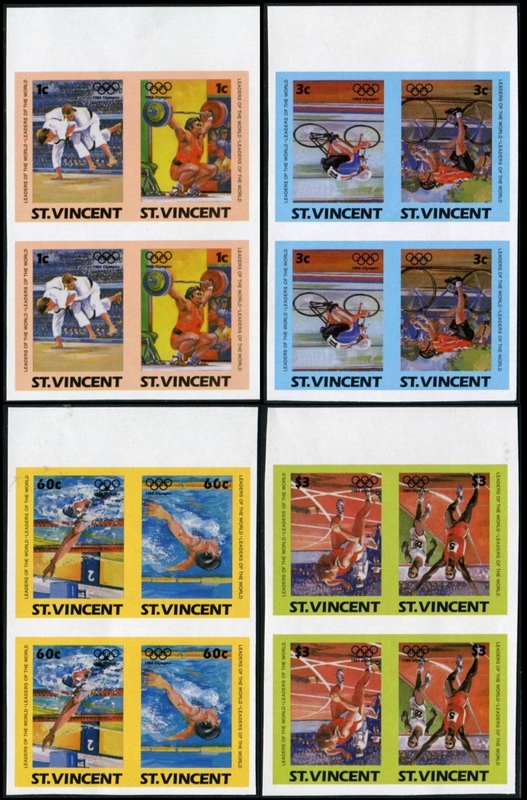 For this issue it appears that the Format Printers used various types of screens and also used no screening on certain white areas, using instead the whiteness of the paper as part of the overall design of the stamp image. 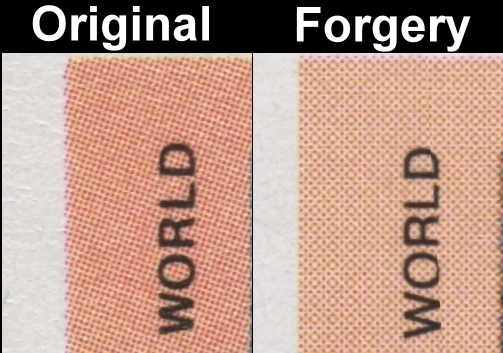 This indeed makes the stamp image very hard to duplicate and thus it is easy for you to tell the fakes from the originals just by looking at the whitest parts of the image! Here you can see a big difference in the color of the weights. You can also see the fonts are very close. Can you see the difference in the screens used? Look at the yellow areas. Format used a fine "dot" pattern on the yellow. 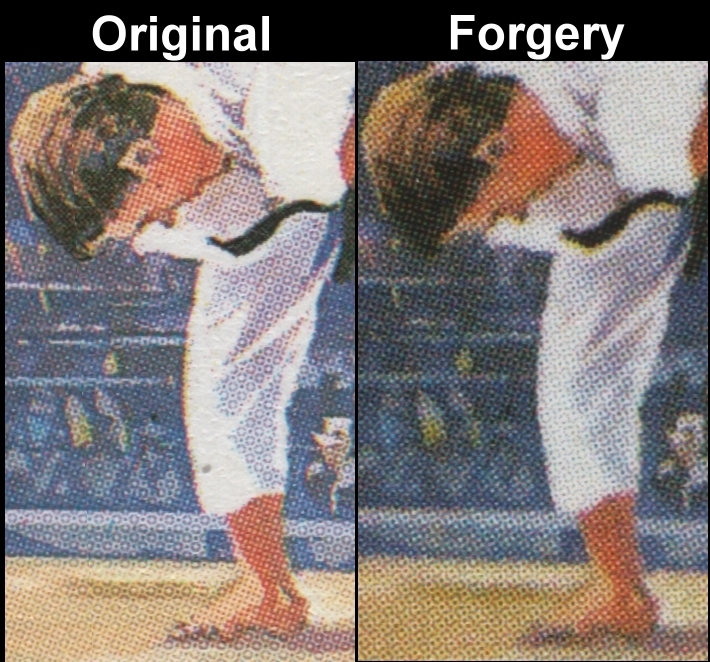 The forger continues to use the same screen throughout the image. Another easy way to tell which is which. 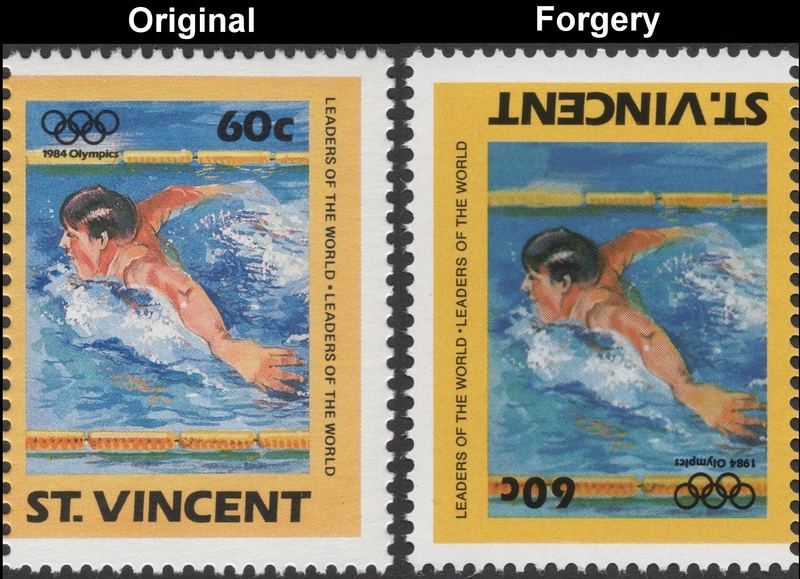 Note the deeper blue color frames on the fakes versus the light blue color on the originals. 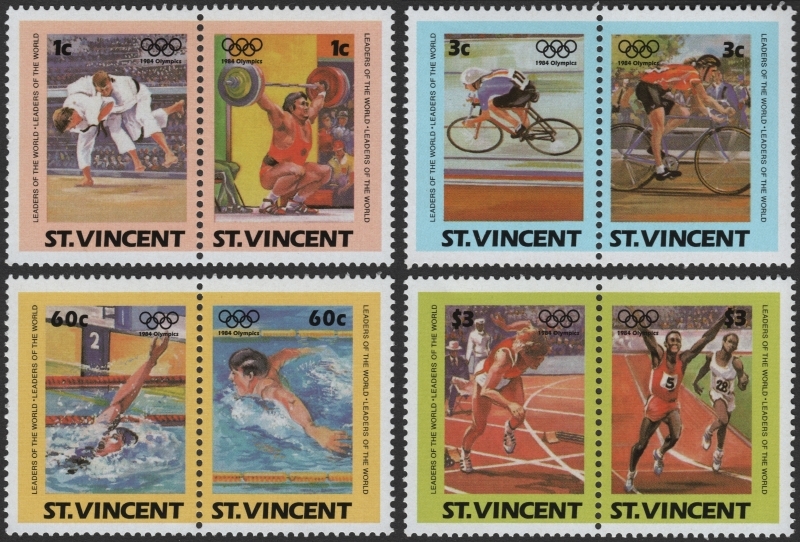 You can now define the Saint Vincent 1984 Summer Olympic Games stamp forgeries easily and can now possibly avoid being ripped off! Sorry to say this, a lot of you already have been fooled and more of you will be until the right people get serious about it!